to four times less volume as compared to conventional wood glue. A cured Nexabond glue joint is stronger than the wood itself, meaning that the wood will fail before the glue will. For its innovative properties, Nexabond has been awarded the 2013 Visionary Award from the Association of Woodworking and Furnishings Suppliers (AWFS). bonding times. 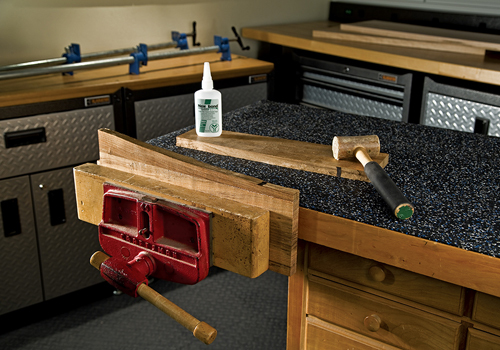 The quick bonding time frees up clamps to be used in the next application and is also quick enough for pieces to be held in place by hand that cannot be clamped. With no activator required, it is ready to use right out of the bottle. It has a thicker consistency than CA glue, eliminating runs and drips. 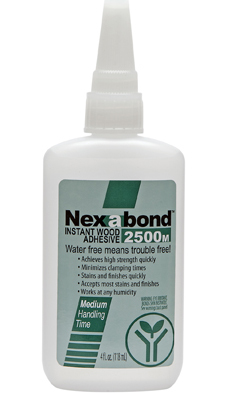 Unlike most wood glues, Nexabond contains no solvents - not even water - so the wood won't swell. It can be sanded immediately after curing without worrying about sunken joint lines due to shrinkage.